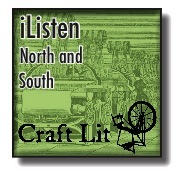 Chapters 50–52 / vol 2 chs 25-27 of North and South, by Elizabeth Gaskell, with many thanks to our reader, Barbara Edleman. Book talk begins at 10:26. The first N & S episode is 331. If the iTunes feed ever goes down, please head over to the Libsyn site, the Premium Audio stream can be found here.
. . . she said grinning. . .
Forgot last week: Give Wrap! Deb's Quilting needles arrived—what a difference THAT made! And she shared her online source, too. Thank you, Deb and everyone who called and wrote in with advice!!! Caller Donna - Thank you for the help with My Thread! Listener Lisa has a Rhinebeck package for you! October 13th is the deadline! NEW GIVEAWAY COMING IN NOVEMBER! Embroidery Book WINNER is . . .
BTW, the stories are often more "chilling" than "scary," more "twisty" and never "gory." I seriously wouldn't be able to record for them if they were anything other—I have to sleep at night, after all. Thing 1 listened to one of my recordings and said, "Geez, Mom. . . I couldn't figure out why they had you recording for them. . . but you really DO sound creepy!" High praise from the 14 year old. North and South OhMyGoshIHaveToTalkAboutThis Book Chat! Join us! Free, fun, and fabulous! Hosted on and recorded by Vokle.com—so if you cannot attend, you'll be able to watch the recording later. Not much to put here. . .
We're doing the big surprise today – Part Two, chapter 1 this weekend. Info on signing up for the Premium Audio in the right sidebar; click the pic of how you like to listen.